The Irish have a peculiar tendency for colour-blindness. In old Gaeilge there was no distinction between the colours blue and green. They were commonly referred to as the gorm (blue). This is a tradition they have held onto when it comes to their national flag. If you asked Irish people on the street to name the colours of the Irish Flag, the Tri-colour, you would more often than not get the response of GREEN, WHITE and GOLD. This may appear to be close to the truth but it is in fact way off the mark The GREEN, WHITE and GOLD are the colours of County Offaly. 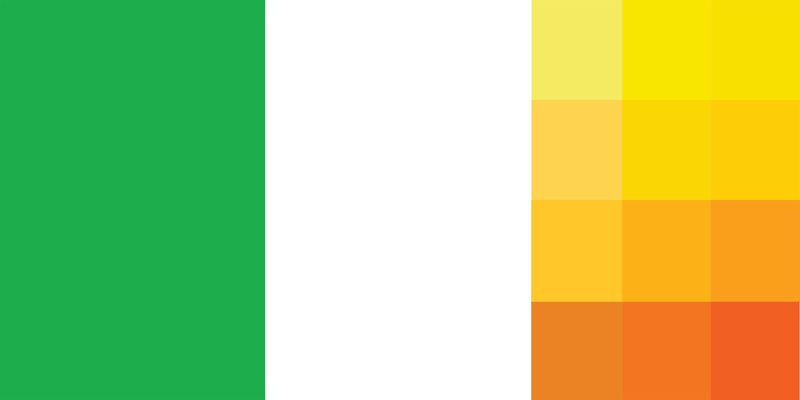 The fool’s GOLD in the Irish flag is the colour ORANGE. The Irish flag is a symbolic creation and colours mean peace (WHITE) between the Catholics (GREEN) and the Protestants (ORANGE). The reason for this act of unconscious historical colour blindness is sectarian. It may seem like a small trifle, but this condition ranges right across the spectrum of Irish society. I have heard News programmes referring to the flag as the GREEN, WHITE and GOLD. I came up with this design for a flag in 1996, under the somewhat limited title of FREEDUMB. I sat on the idea bidding my time to use it for an appropriate exhibition opportunity. The flagged exhibition came up in Carlow, which seemed as good a time as any to dust it down. It’s an open-ended flag, one that has the potential to represent disparate people, causes and ideas, ranging from emigrants, atheism to pro-choice and pro-life, etc. I personally see it as an open-ended flag for the present, how and where we find ourselves living in the universal here and now. *working title: not quite sure what to call this one. If I call it something it’ll help to steer it but also aid in closing its possibilities down. Untitled is a bit overused, maybe ‘Genuinely Untitled’ or ‘Untitled for the want of avoiding narrowing down pigeon holes’ would be more appropriate. Or maybe it should simple be ‘ ‘ which is very open-ended, but long-winded. I was approached by Neva Elliot to do work for Flagged as part of Visualise Carlow. I designed 3 flags, one of which has caused problems, which if truth be known was anticipated. It was an altered American flag with permanent fabric flames attached. My original idea for the flag was loosely based around the image of a Jasper Johns flag painting set on fire by a Roy Lichenstien spark. ‘The Eternal Flame’, is an environmentally friendly USA flag, without giving too much away; it is a protest flag against Environmental Terrorism with genuine practical environmental benefits. (Unfortunately the prototype is going to cost the equivalent of 150 cheap Korean made American flags). I was a bit surprised when they seemed to agree to the 3 flags without a hitch. Fear not the Town Clerk was on hand. He had a problem with the burning flag, which he construed as being overtly Anti-American, and as such would reflect badly on Carlow. I was informed that it could not go up in Carlow Town. That’s not so bad, I thought when I first received the news. I can work with that, a bit of censorship is good ammunition for the kudos. My brain was racing with strategies to get the most out of the situation. Some people suggested pulling out of the show. I figured that’s self-defeating and not much fun, I could use the situation as raw material. I also wanted the artists’ fee to pay for manufacture of the flags. The County Council seemed happy with the explanation and sympathised with my concerns. A compromise was devised. That flag would not go up a flag pole in Carlow town but could be show in the shop window of one of the events sponsors, as long as there was a piece of text explaining the work, so as to fix its meaning and context. The argument was they didn’t want the work to be misunderstood and it also had the added extra bonus of dodging the censorship issue. I half agreed, so as to buy a bit of time and devise a strategy for the new situation of: not quite censorship, but censorship of a kind, all the same. If it’s context they want, its context they’ll get. Carlow County Council is happy to use art and the cultural status it can bring. I presume numerous reports on the positive benefits of art in public spaces were consulted before embarking on the Visualise Carlow program. Art is good for a town’s image. It can give its citizens a playful urban distraction in the midst of their daily lives. This present situation indicates that they want all the benefits of art as long as there’s no trouble. 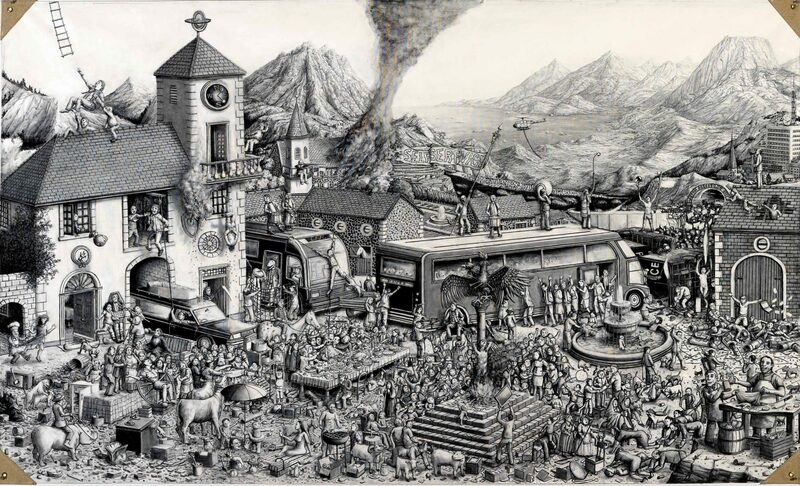 The problem with this is that some of the best art is troublesome and awkward by its very nature. I always find the label of anti-American laughable, what’s it’s opposite, pro-American? To uphold the values of the British, Spanish and French colonial Empires of the past is no longer considered a morally or ethically acceptable position. Any opposition to American foreign policy is adduced to be un-American, which is short hand for unpatriotic foreigners. The neo-liberal media of this country adopts this lazy attitude as an easy put down against any rational argument of dissent. It is the articulation of knowing what side Ireland’s bread is buttered on. I realised that the Council would always come out on top in this situation. They hold the cards and have already made me compromise the work, but I didn’t want to make it too easy for them. It would be tactical suicide for me to be full of gung-ho self-righteousness and hurt my future possibilities in the art game by being easily written off as: too much hassle, not worth the trouble. I wanted to try and come out of the situation with the least amount of compromise. The County Council was prepared to commission me to come up with (hopefully) relevant and contemporary public artwork, which could (should) initiate broad local interest and debate. If they accept this version of the work they will get a soft focused version of the proposed artwork. But they will also be seen to distance themselves from the actual work and at the same time benefit from the prestige of taking on artwork, which is of a difficult critical nature. Have your cake and stuff your face without an addition of weight. As a result I have decided that the sight of the Eternal Flame is too dangerous to show to the people of Carlow. As such, I am displaying the flag folded up in a position fit to adorn a coffin. The County Council is of the view that its citizens need protection from their fertile imaginations. Who knows what could happen, they could accidentally use their own creativity and come up with a different meaning for the work that the artist didn’t mean or intend, god forbid we can’t have independent thought. Encouraging people to see and interpret the world according to their own personal experiences and perceptions has to be the worst possible thing a work of art can do to you.